Severnaya Verf shipyard has laid down yet another longline factory ship of Project МТ 1112XL. The keel-laying ceremony for the ship named Marlin intended for OOO Globus has been held today, on 14 September 2018, in the framework of the II International Fishery Forum, reports IAA PortNews correspondent. The ceremony was attended by representatives of the Federation Council, Rosrybolovstvo (Russian Federal Fisheries Agency), Saint-Petersburg Government, OOO Globus, Severnaya Verf shipyard. In 2017, the Board of United Shipbuilding Corporation agreed the contract of Severnaya Verf shipyard (part of USC) with three fishing companies: OOO Virma, OOO Globus and OOO ArktikrybFlot for the construction of a series of four longline factory ships. Two longliners will be built for Vyrma, and one for each of the two customers. The series delivery is scheduled for 2022. 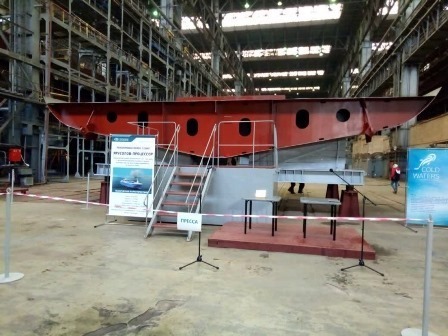 The first longline factory vessel of the series, Gandvik-1, for the fishing fleet of Karelia was laid down on 20 July 2018. A longline factory vessel features high-technology and ecological fishing method with automated installation and hauling lines, with equipment for complete, non-waste processing and storage of the catch directly on board the ship. The longliner reference design documents was developed by Norway based Marin Teknikk AS. Detailed engineering, technological and operational documentation will be developed by a Russian naval architecture and marine engineering firm. The vessel’s displacement is over 2,000 tonnes, length - 58.6 meters, width - 13 meters. Severnaya Verf shipyard (corporate member of United Shipbuilding Corporation) is among leading shipbuilding companies of Russia’s defence industry. The company was founded on November 14, 1912, as Putilovskaya Shipyard. Since then the shipbuilding company has built more than 600 warships and commercial vessels, including cruisers, destroyers, minesweepers, patrol vessels and submarines destroyers, research and passenger vessels, timber cargo carriers, trawlers, container ships and Ro-Ro vessels, tugboats and floating docks. The shipyard’s backlog of orders currently includes the series of frigates, corvettes and other vessels.